The first book of 2017 to arrive at the Lace and Embroidery Resource Center is one that will be welcomed by lace collectors, curators, historians, costume experts, and designers. Point de Gaze is one of those laces that, at its finest, can (especially under magnification) make one forget to breathe. 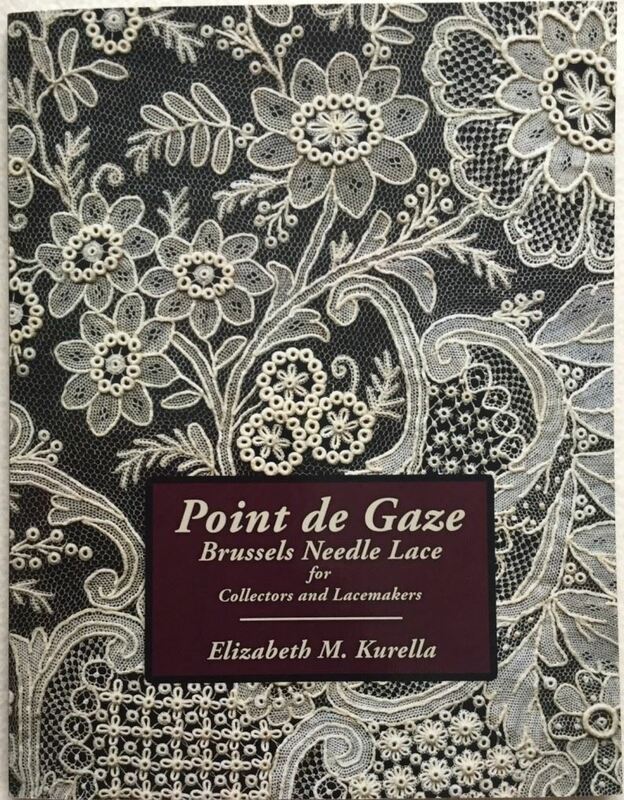 To explain the title of this book: Brussels needle lace was a precursor to the Point de Gaze developed in about 1850, and manufactured until the early 1900s: a span of about 50 glorious years for this lace before machine-made laces finally won the lace manufacturing "battle". Elizabeth Kurella's special brand of lace identification insight informs each book she has written. She counsels it is technique, not design, that provides the means of identifying specific types of lace, which leads to the assertion that as soon as a set of designs became popular, they were copied in whatever technique was available, including machine. To those who claim to be lace experts, it is of importance to have the ability to differentiate between Point de Gaze (Belgian) and other refined European needle-made laces of this period, such as Alençon/Argentan/Point de France (French), and Burano/Point de Venise (Italian). Photo captions generally include descriptions rather than simply names, because there was never a single authority that assigned names to types of lace. As with all laces, the ability to personally touch it with your finger tips and study both sides of Point de Gaze under magnification adds exponentially to knowledge. If you love the genteel needle-made laces of the past, this book teaches a lot about how to view and enhance your appreciation of all of them. Judging from current auction offerings, quite a lot of this stylish needle lace is still available.